Download our MAcc brochure today! The Master of Accounting (MAcc) program is a 30 credit hour program (10 courses) which provides an advanced education in taxation, financial accounting, and auditing necessary for students to pursue leading positions in public practice, business, government, and related fields. The MAcc is designed to provide the skills necessary to build a successful career in the multifaceted, dynamic practice of accounting. Completion of the MAcc fulfills the 150 credit hour requirement for becoming a CPA. Internship, career development services, and other opportunities further enrich and support your graduate accounting studies. Nationwide, accounting firms have significantly increased hiring MAcc graduates and decreased hiring bachelors graduates. Admission to the MAcc can occur through application to the traditional MAcc or the 3/2 MAcc program. MAcc classes are mostly taught on weekday evenings (Monday through Thursday), allowing students to work or participate in internships. The MAcc curriculum includes five core courses and five elective courses, with suggested concentrations in Taxation or Financial Reporting/Auditing. The MAcc is a 30 credit hour program (10 courses) which requires 15 hours for the core curriculum and 15 hours of electives. Students are required to complete five accounting electives, three of which should be in a concentration (Tax or Financial Reporting/Auditing). Elective courses supplement the core classes with detailed study into a particular area of accounting and provide some individual focus. Since the MAcc requires 18 hours of graduate courses (600 level or above) and requires two 400 level courses in the core curriculum, generally only two electives from 400 level courses can qualify. See webpages on Tuition & Fees and About SOA. 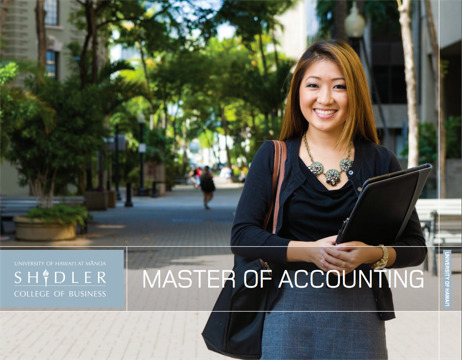 The Shidler College of Business is the only AACSB International accredited institution in Hawai‘i that offers a Master of Accounting program. After passing the CPA examination, SOA alumni often choose a variety of positions in addition to practicing as a CPA. For example, over 40% of our alumni who are active members of the Hawai’i Society of CPAs are not practicing CPAs, but are working in business and industry. In a survey of graduates, the SOA found that about 84% of the responding graduates are working in accounting-related positions. Strong alumni network – about half of the CPAs in the State of Hawai‘i are Shidler College alumni and many more hold leading positions on the U.S. mainland and around the world. Have a 3.4 overall or 3.4 accounting GPA. No automatic admission is granted if meeting these requirements; the final admission decision is determined by the SOA admission committee. GMAT is not required for admission. Pay the lower undergraduate tuition rates for up to six credits towards the MAcc degree. Gain advanced admission and smoothly transition into a graduate program while finishing your undergraduate degree. More efficiently complete the MAcc and meet the 150 credit-hour CPA licensing requirement. Classes are offered at night, so students can work during the day while enrolled in the MAcc. The deadline for scholarship consideration and international applicants is March 1st. The regular review deadline for all MAcc applicants is May 1st. Students with an accounting degree must complete any missing courses prior to graduation from the MAcc program. If you have any questions regarding the information above, please contact Marc Endrigat at endrigat@hawaii.edu. For more information, see webpage on How to Apply.